In a recent trip to Washington, D.C., I made sure to stop by one of my favorite Smithsonian museums – The Museum of American History. This time it was definitely on my touring highlights for their new exhibit: FOOD: Transforming the American Table 1950-2000. 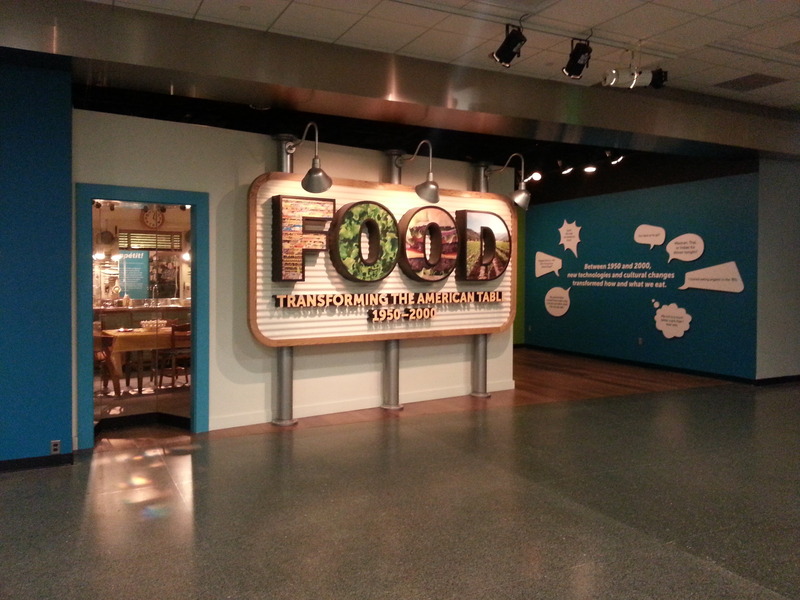 The exhibit was promoted as exploring some of the major changes in food and wine in postwar America including new technologies and their impact on production, preparation and consumption. However, the American farmer was largely missed despite the fact that one U.S. farmer produces enough food to feed 155 people, up from 25.8 people in 1960, due to their impact in leading the development and implementation of new technologies. In today’s culture, forgetting the source is not something new. When you ask people where their food comes from, most often the response is “from the store.” This problem is escalated by conflicting and constantly changing nutritional advice, including the USDA’s latest version of the food pyramid. Changes to the food pyramid and food pyramids from around the world were highlighted in the exhibit’s “Open Table.” The latest changes include a de-emphasis on animal foods raised by American farmers and ranchers which was also reflected in the FOOD exhibit. Instead of calling the MyPlate section “Meat, Fish and Eggs,” that category is called “Protein Foods.” However meat, fish and eggs provide more than just protein – they provide protein, iron, zinc and vitamin B12 among other essential nutrients. For more on the nutritional value of meat, read the past blog post: Meat, the Facts. Is it really necessary to devalue meat and poultry by pretending that they’re just small players in a generic “protein” category? The proverb “never bite the hand that feeds you” seems to have been forgotten by most, despite the hard and dedicated work of American farmers who provide healthy and nutritious food including meat; poultry; fruits; vegetables; wheat for bread, pasta and cereal; milk for yogurt, ice cream and much more for Americans and millions of others around the world. So before you dine on your next meal, please take some time and thank a farmer and rancher. This entry was posted in General and tagged farmers, Food, myplate, USDA. Bookmark the permalink. I really would like to catch this exhibit. There are several things in the farm realm headed to the Smithsonian too… could be some interesting things to catch. I don’t feel it is devaluing meat by pointing out the need for protein but it may be inconsistent with the other labels.